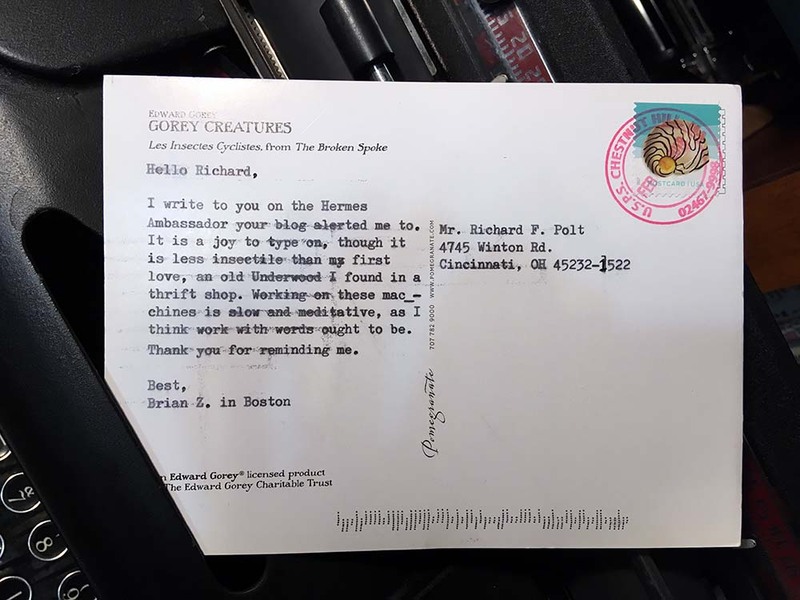 Sometimes I get letters that are especially moving. Here's one that speaks for itself. 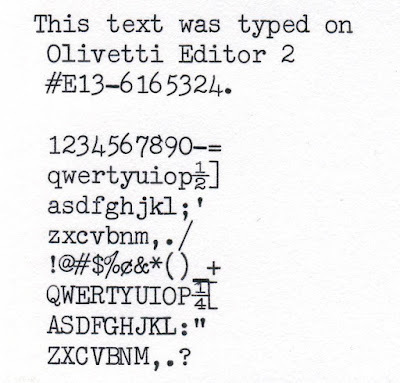 My attention was caught a couple of years ago by this Olivetti-Underwood Editor 2 (#E13-6003749, formerly in the Brumfield collection), as pictured on The Typewriter Database. Its beautiful typeface is Elite Correspondence Gothic, according to the 1964 NOMDA Blue Book. 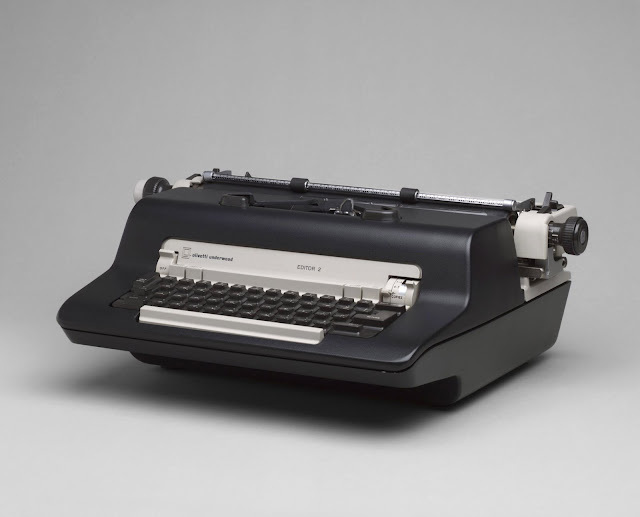 It wasn't just the typeface that attracted me, but the stylish curves of the typewriter. Designer George Nelson had the honor of having the Editor 2 included in the collection of the Museum of Modern Art. 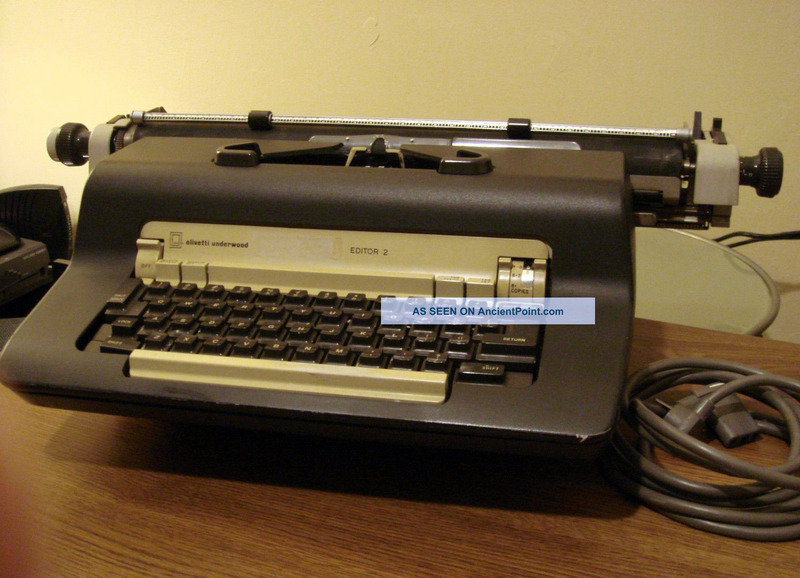 Nelson also designed typewriters for Royal in the '60s. 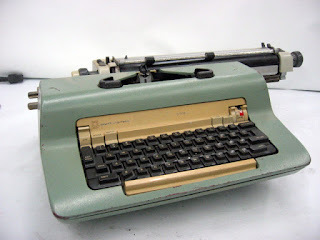 Here you can see what I believe is a prototype design for a Royal electric. 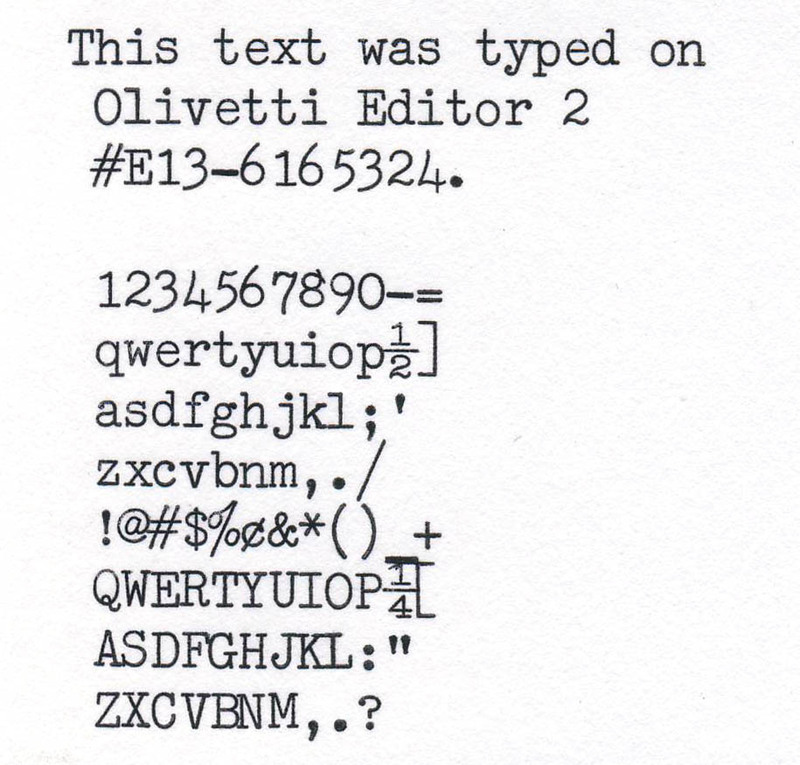 Nelson's protege John Svezia also designed a machine for Olivetti: see the story on Robert Messenger's OzTypewriter. 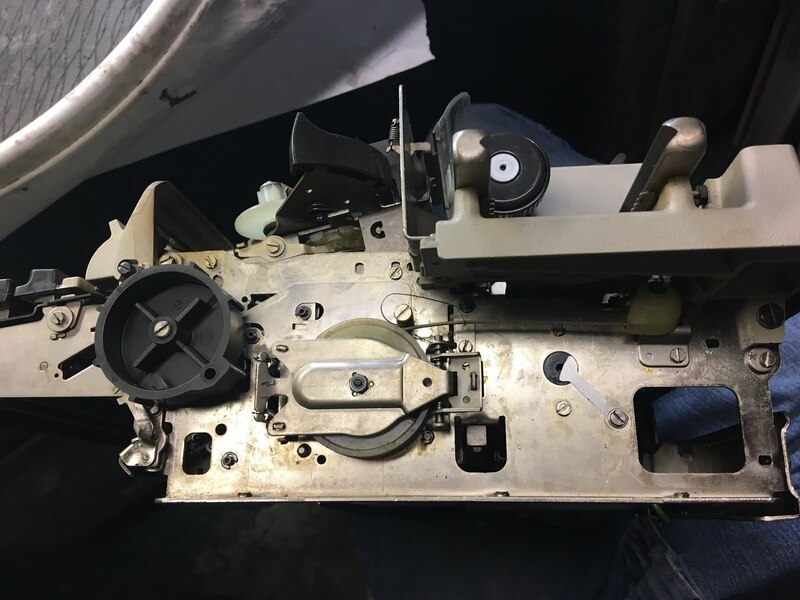 If that's right, then the ex-Brumfield machine that originally caught my eye, #E13-6003749, would date from 1966. 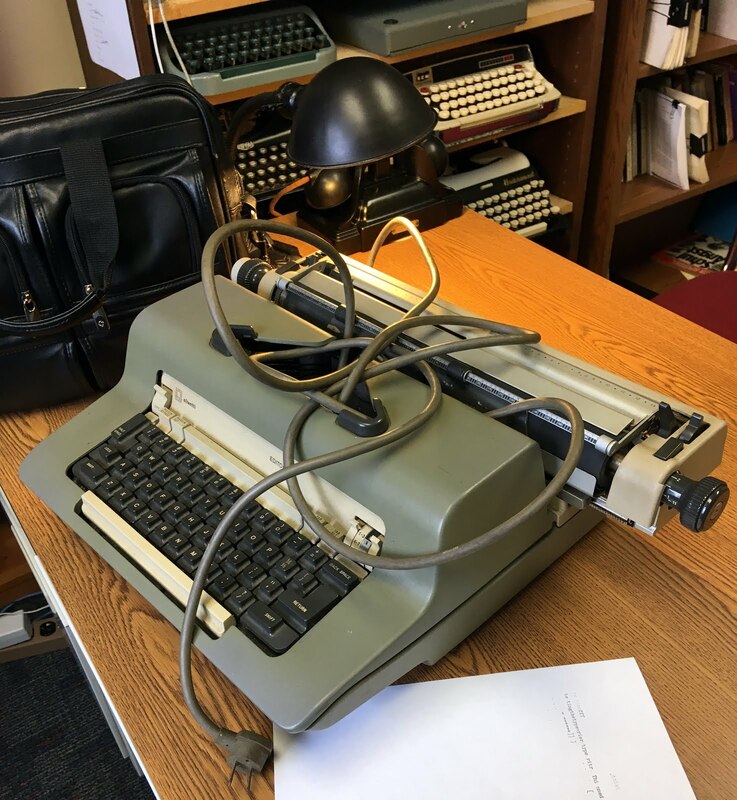 The last machine shown above, spotted by Brian Brumfield in the wild, is #E13-6043025 (1970). 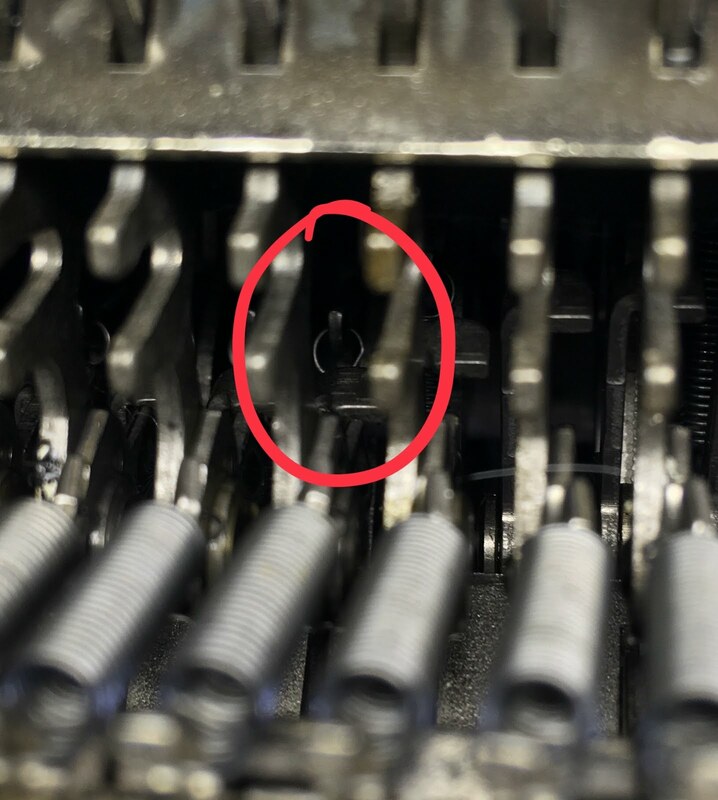 As far as I know, all these Olivetti electrics use a system in which depressing a key brings down a hook (X in the diagram below) that catches on a bail (36). 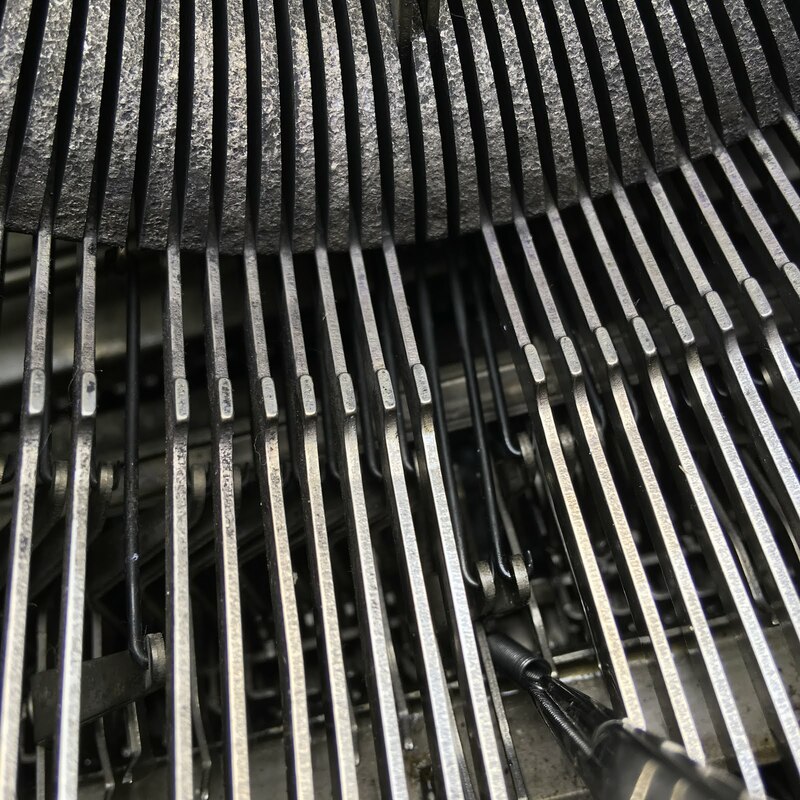 The bail then flips up and activates the typebar. What's particularly clever is that a mechanism prevents two typebars from being activated simultaneously; if you press down two keys at once, the keyboard becomes inoperative. 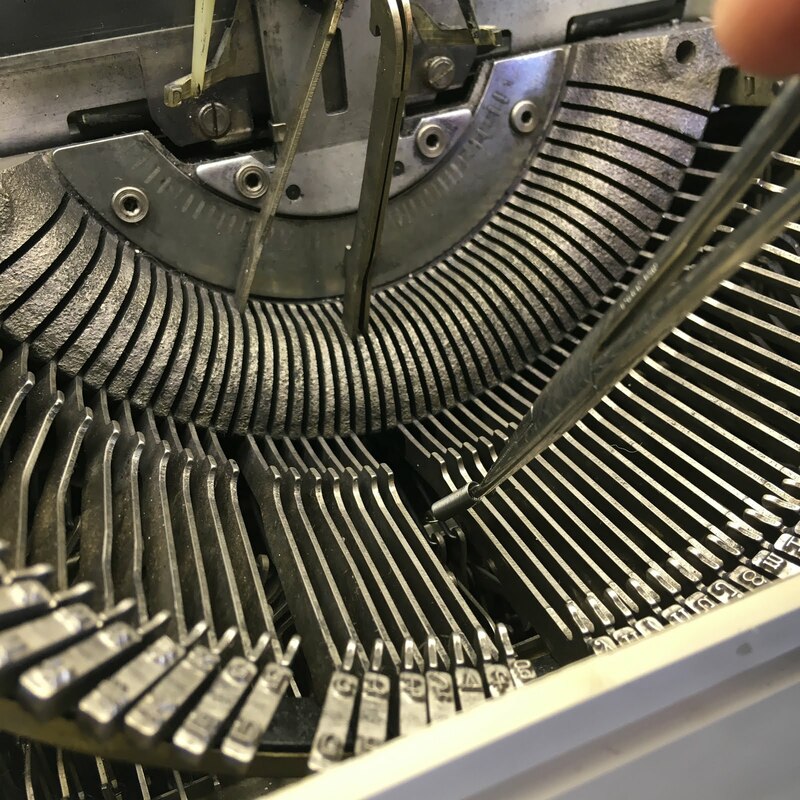 Backspacing releases the mechanism and lets you type again. The diagram above comes from a service manual for the Praxis 48 that you can download here for $6.99, thanks to Ted Munk. 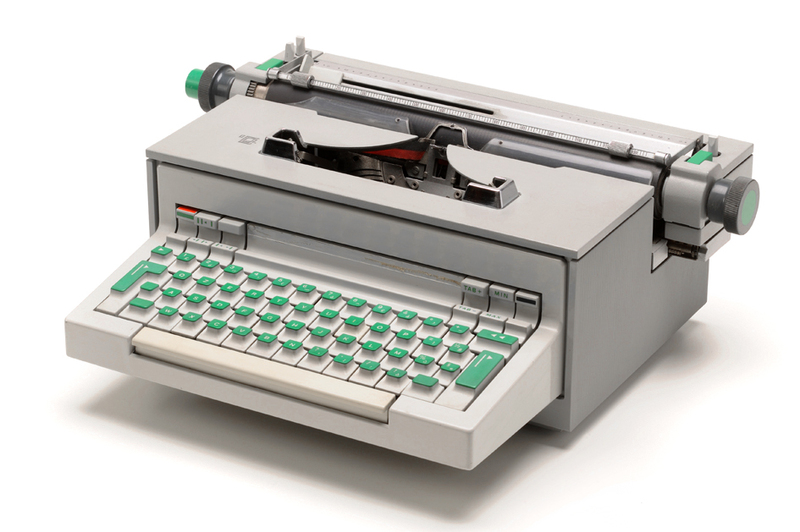 The Praxis 48 is the most readily available Olivetti electric of this type. (Image from Museo Tecnologicamente.) In contrast to the Tekne and Editor, the Praxis 48 is a modest-sized typewriter, primarily for home use rather than heavy-duty office use. It's a very enjoyable typewriter when it's working, but it has a reputation for being very challenging to repair. 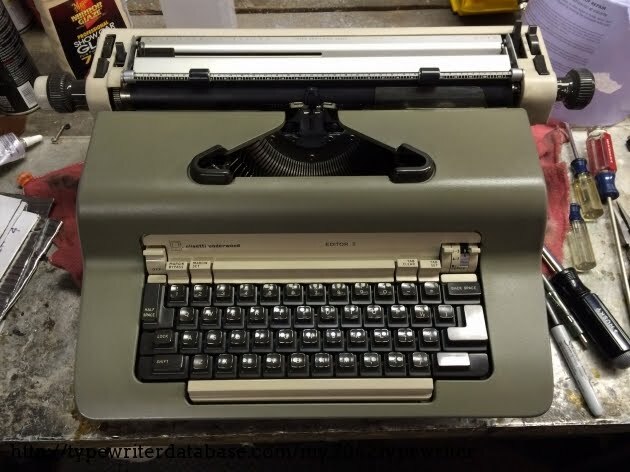 Anyway ... three or four years ago I saved a search for an Editor 2 on eBay, and finally I was rewarded with a hit. But the seller said that it wasn't working. 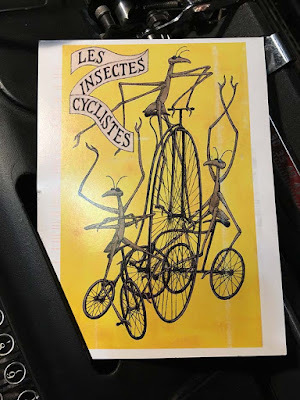 I was scared off. 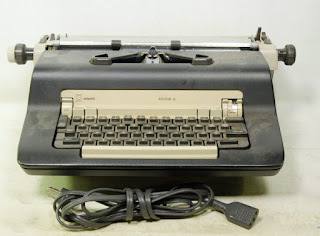 However, after it was listed several times and finally offered for a Buy It Now price of $8.99, I couldn't resist. Soon it was sitting on my desk. 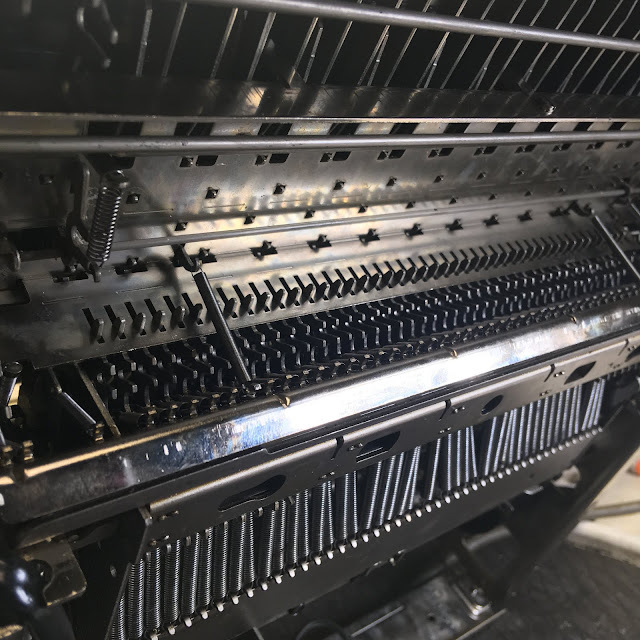 This machine uses a carbon ribbon, so you can discover what's been typed on it. 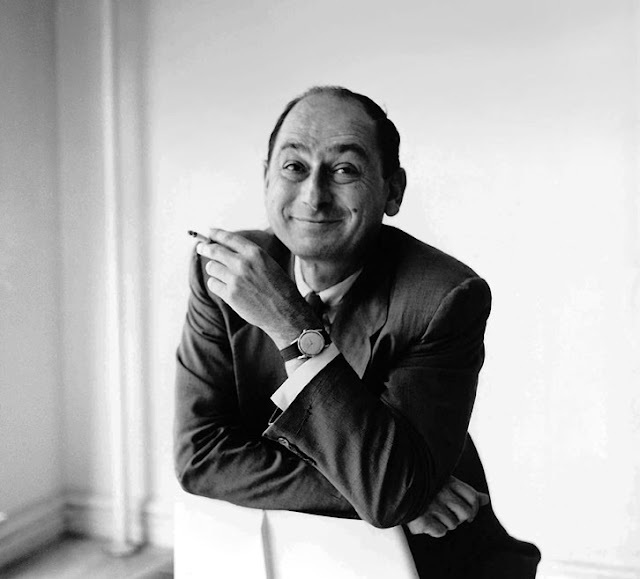 I had a sort of "Shining" moment when I read: "Now is the time for all good men to come to the aid of their country. Now is the time for all good men to come to the aid of their country. 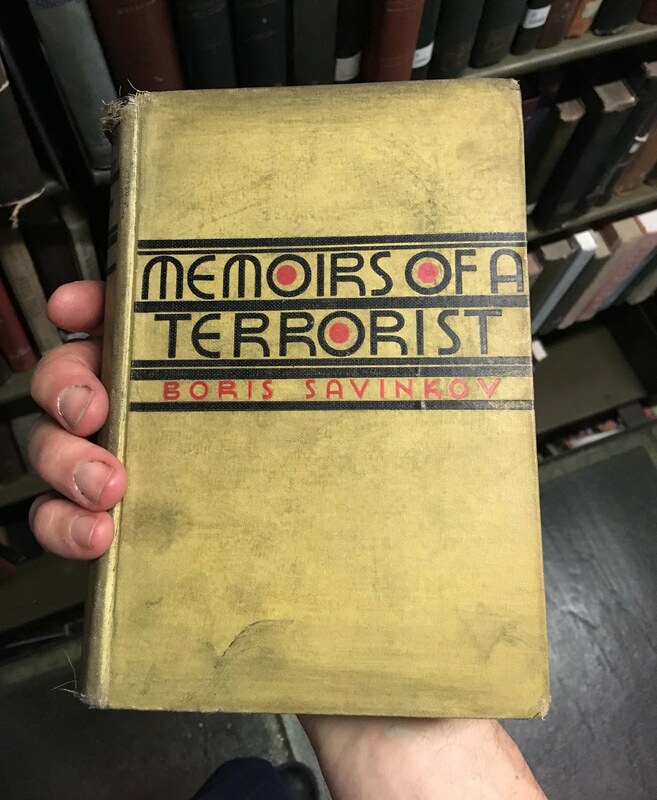 Now is the time for all good men to come to the aid of their country. 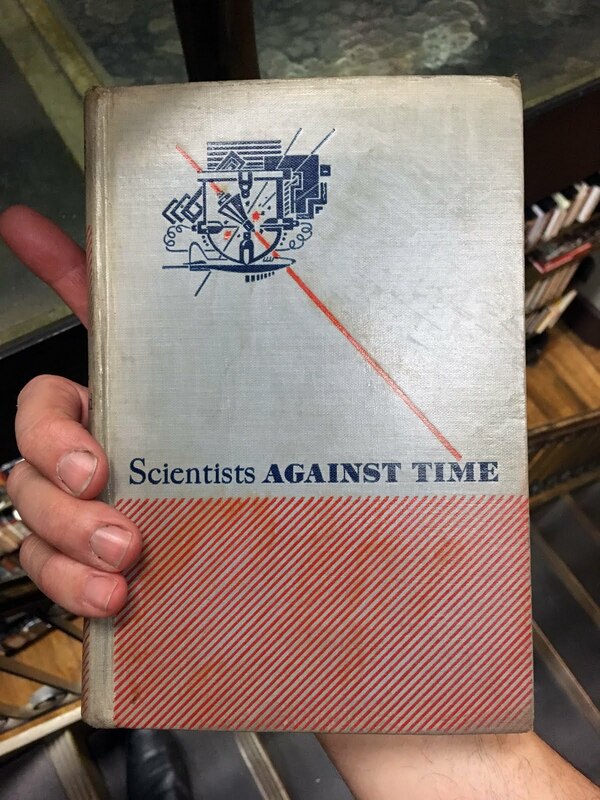 Now is the time for all good men to come to the aid of their country. 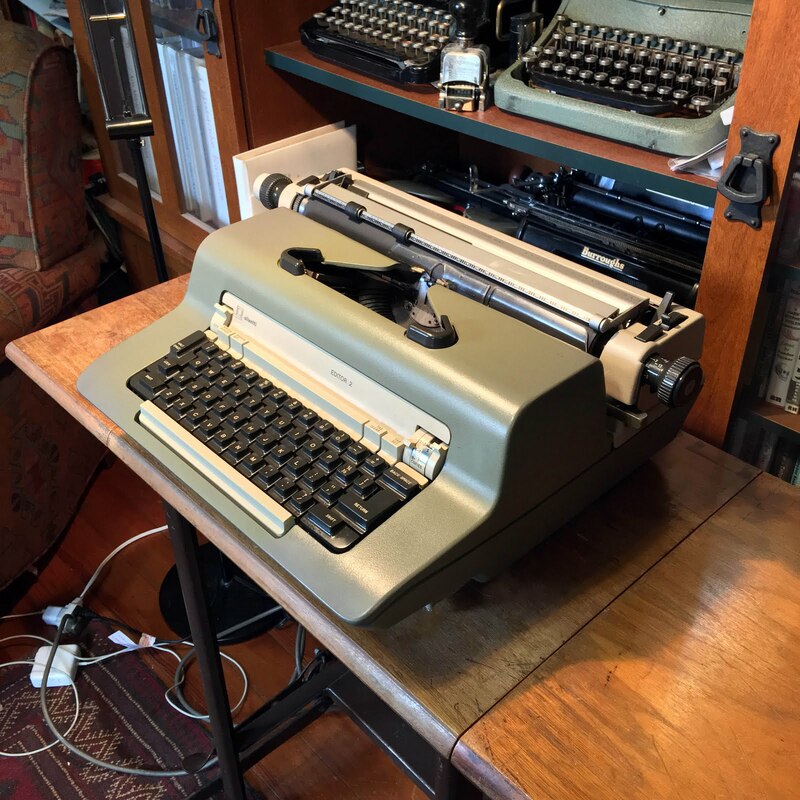 ..." But some older text before this seems to be ordinary business correspondence. If I find anything exciting, I'll let you know! 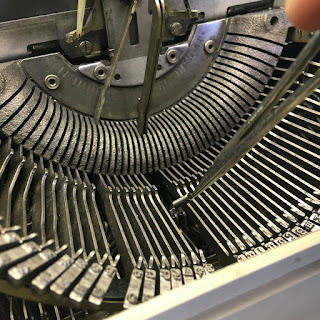 The shell comes off very easily, and I was able to clean and degrease the typewriter, which helped a lot. 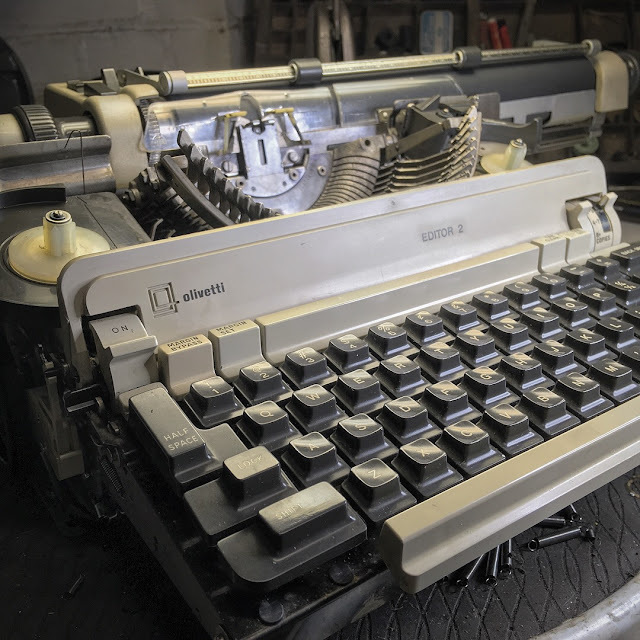 But the carriage return was too feeble. 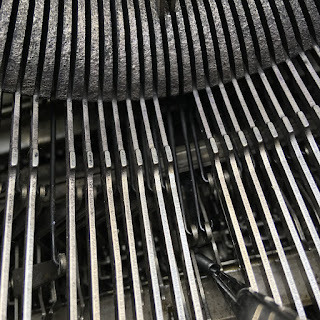 With advice from Australian master mechanic John Lavery, I realized that the wheel that pulls the cord attached to the carriage (in the center of the photo below) needed more friction to connect it to a spinning disk against which the wheel is pushed when you hit the carriage return key. 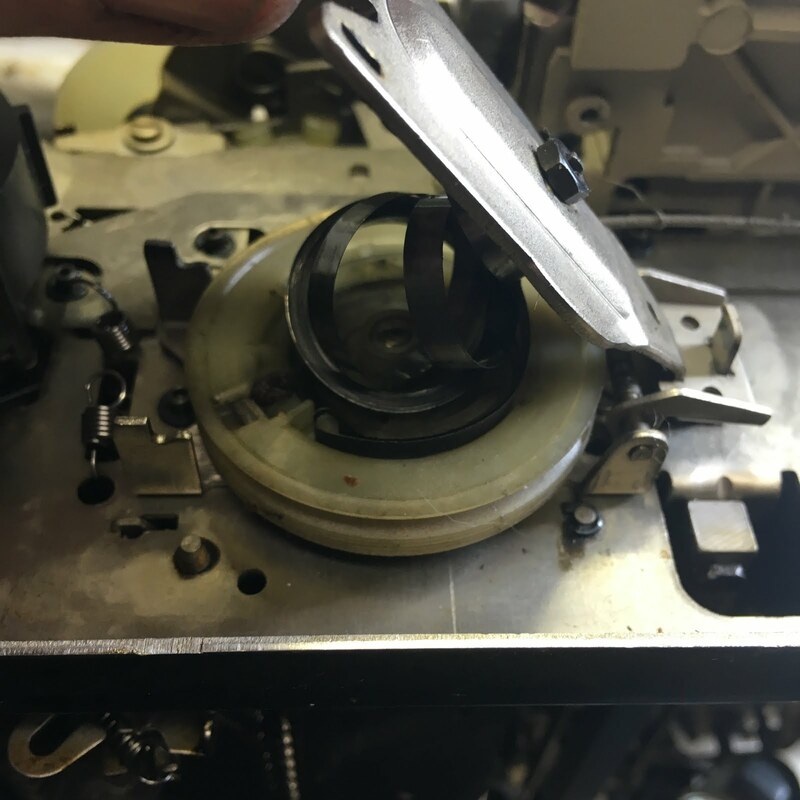 My clever (I hope) solution was to tape a circle of duct tape over the disk. 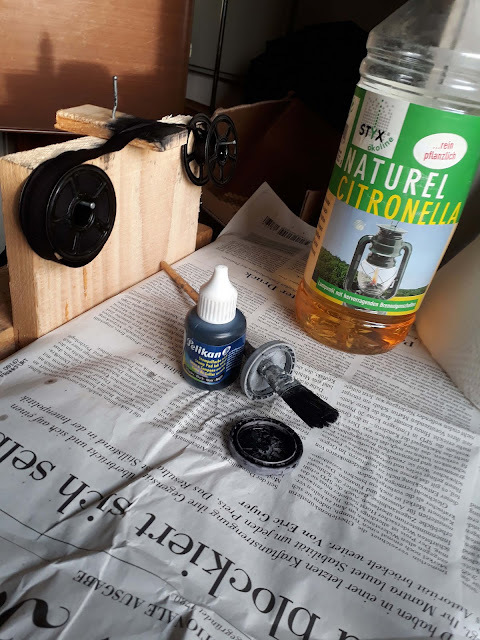 So far, it's working well. 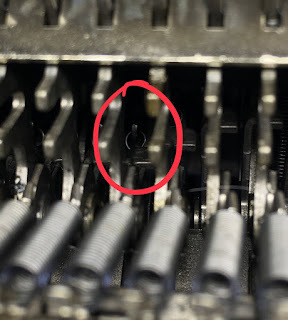 Along the way to this solution, though, I clumsily popped out the spring that winds up the cord. Oops. 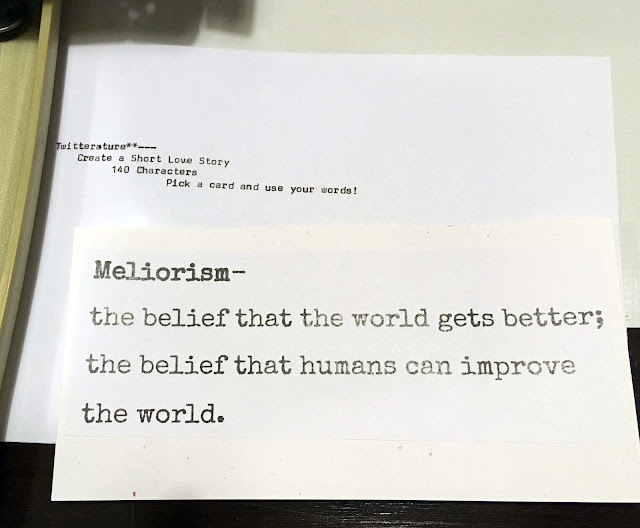 That took a while to correct. But this was not the most frustrating problem. 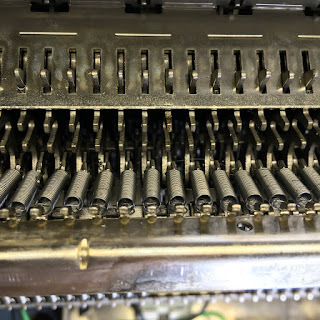 Some keys just weren't working at all, and I figured out that some small springs had gotten disconnected. 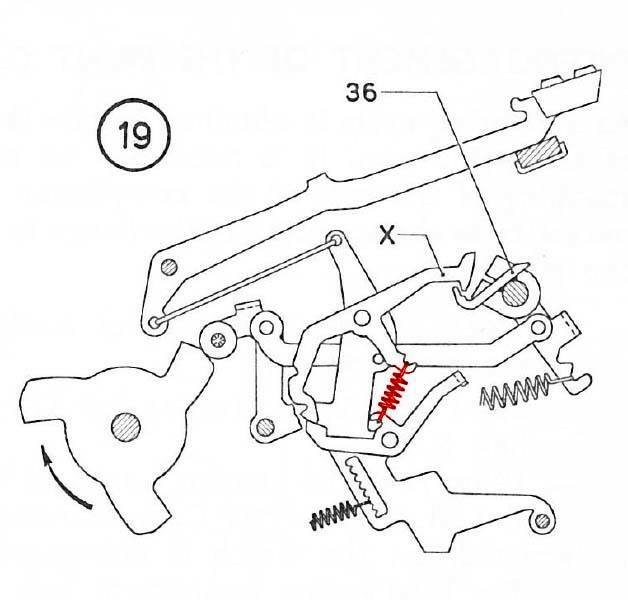 (See the red spring in the diagram from the service manual above.) 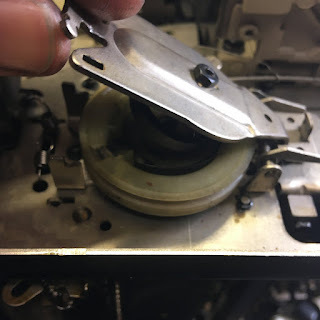 But how was I supposed to get them back in? 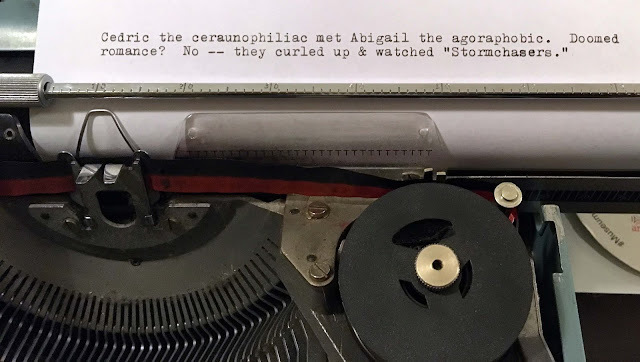 They were deep in the dark woods. The problem was getting enough light, maneuvering in a tight space, and simply learning to see what was going on, when only small portions of the mechanism could be glimpsed at a time. Finally I realized that the best approach was to come in from the top, gripping the spring with a hemostat, fumble around half-blind until the bottom of the spring connected, then connect the top. 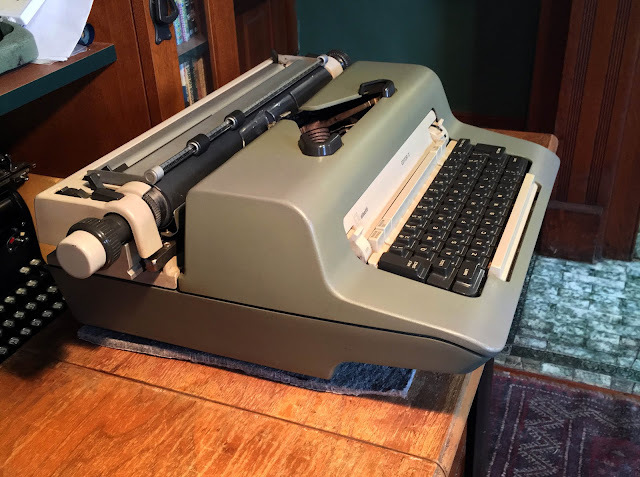 Hours and days and many swear words later, the job was done. It is one of the hardest operations I've performed on a typewriter. 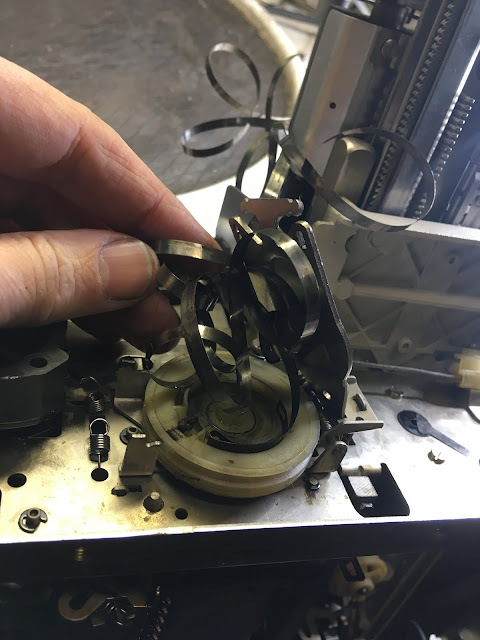 So, does the machine finally work? 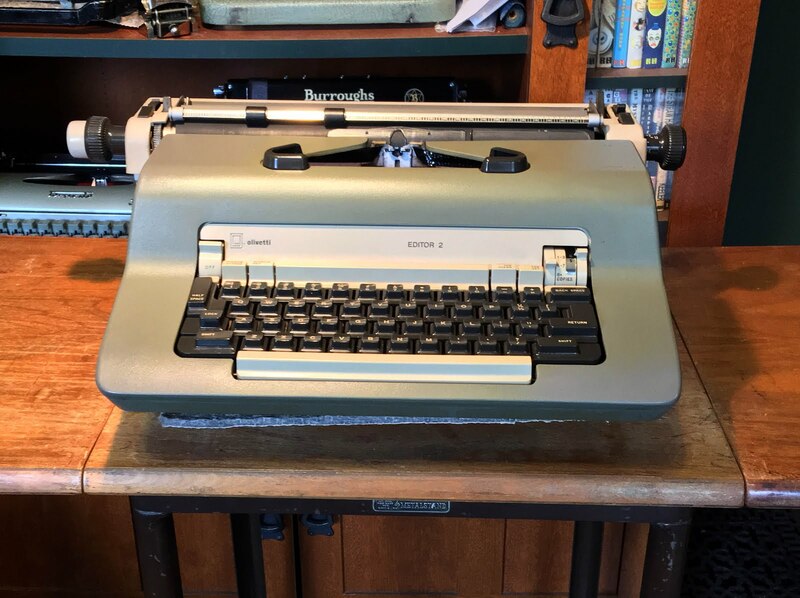 Mystery: when was this typewriter made? 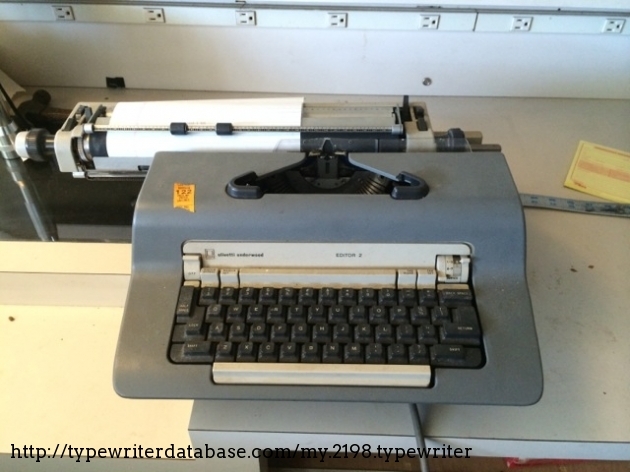 The serial number is far above #6051000, the number listed for the beginning of 1971, and no further years are listed. 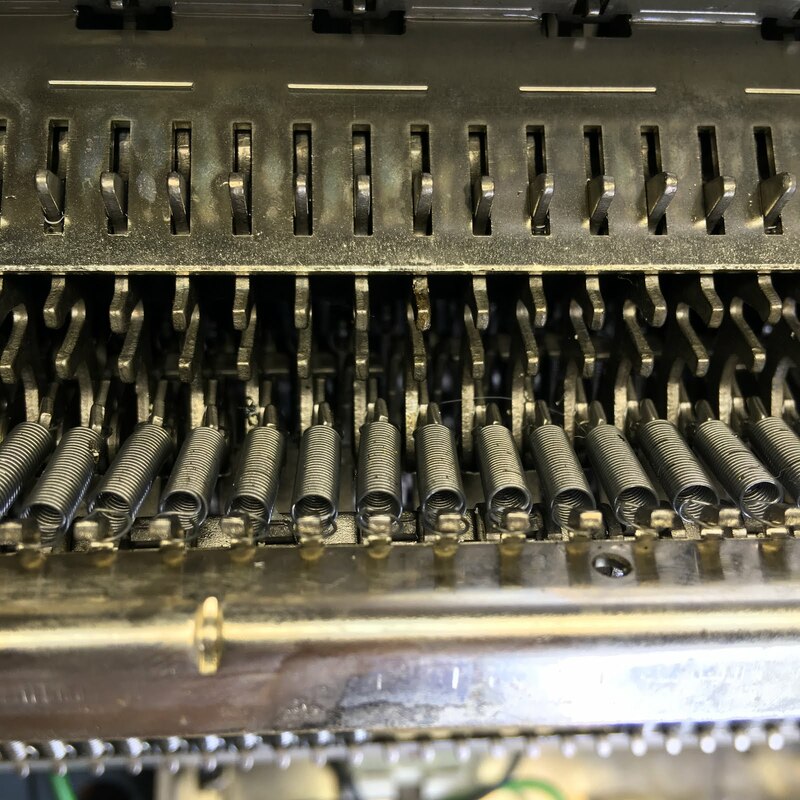 Maybe I haven't found the corrrect serial number sequence, and maybe our data is partial or incorrect. 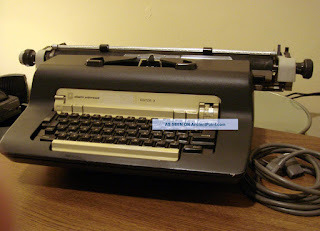 PS: You can find some attractive and informative literature for the Editor 2 on the manuals page of my website. 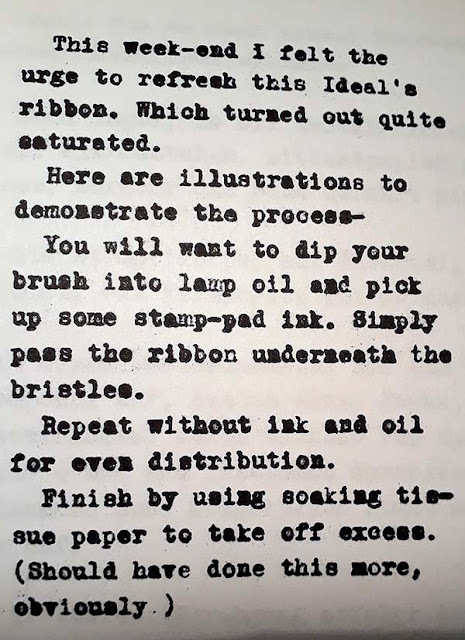 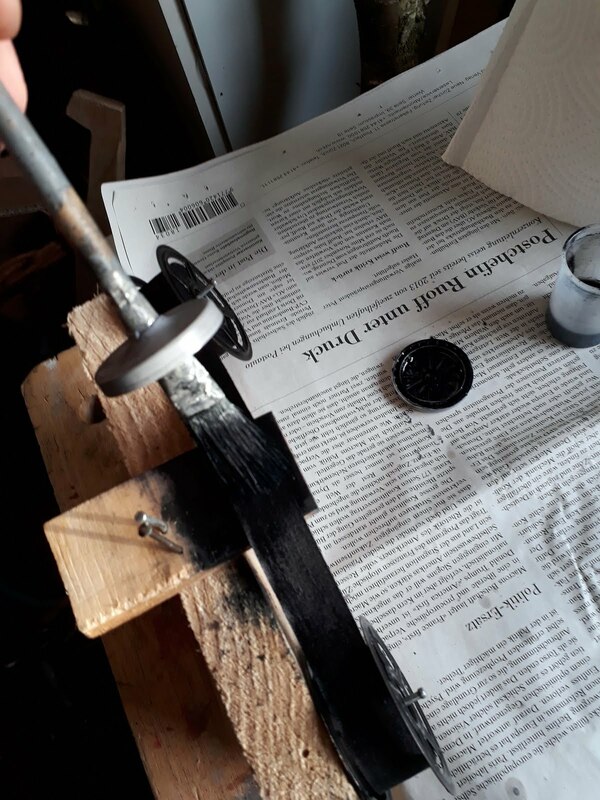 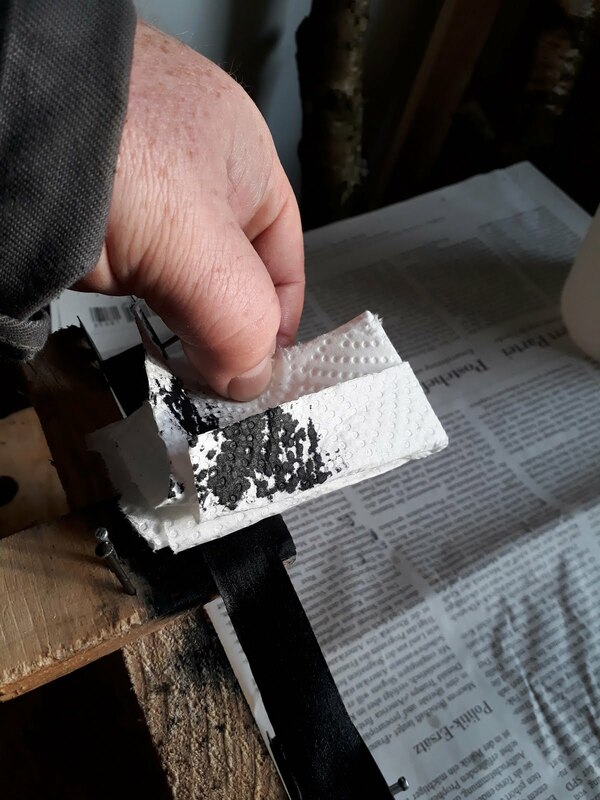 Meanwhile, Klaus M. is perfecting the art of ribbon re-inking — something I still haven't tried myself. 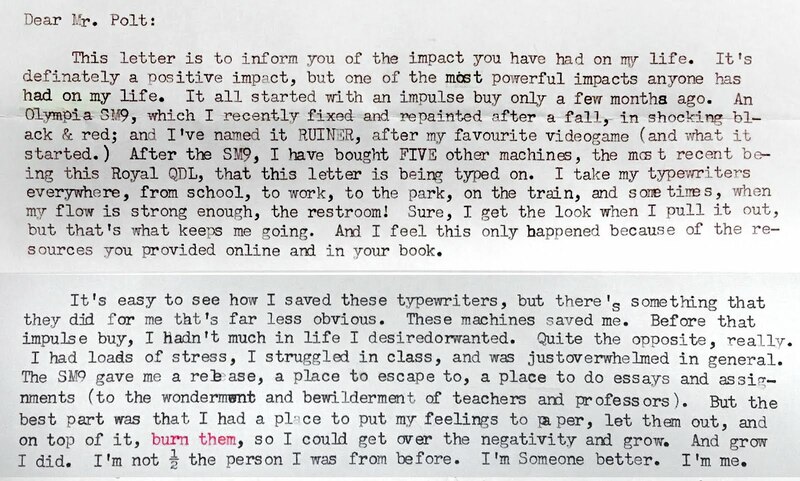 In other news, I became aware of a gifted British artist, Becky Haley, who incorporates typewriting in some of her work. 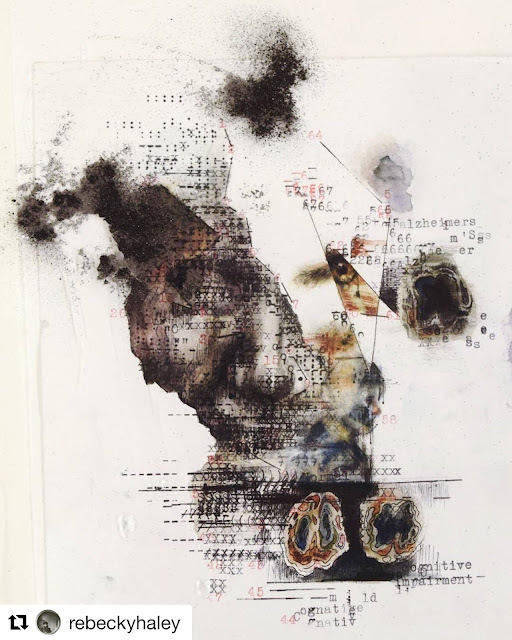 This piece represents Alzheimer's disease. 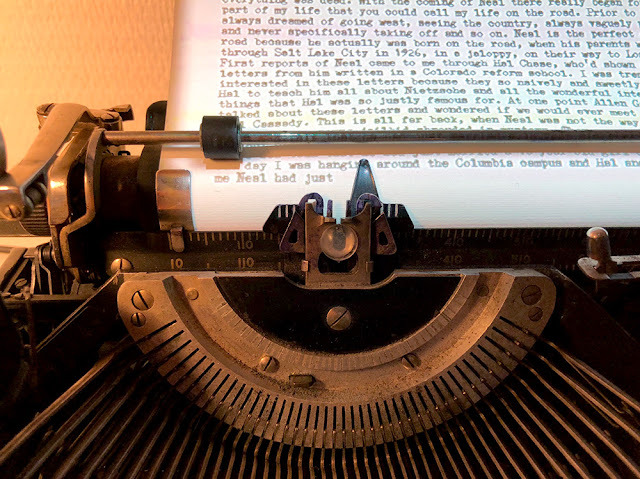 A very different, more conceptual art project, I Am Jack by Sébastien Laading, offers typists the chance to recreate the legendary BAROP* on which Jack Kerouac typed On the Road, with some help from digital technology. 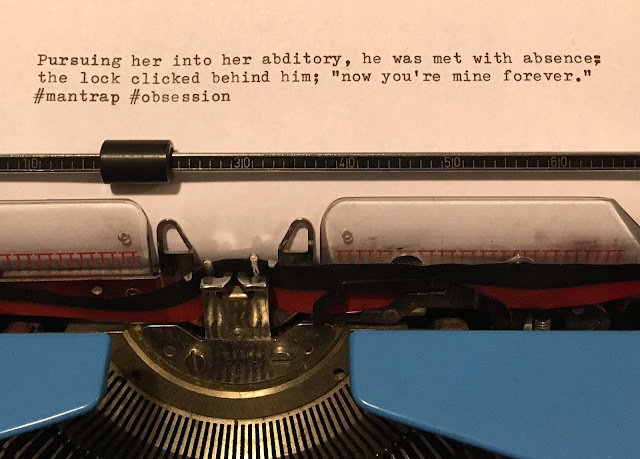 If there's ever a second edition of my book, Haley and Laading should be in it. 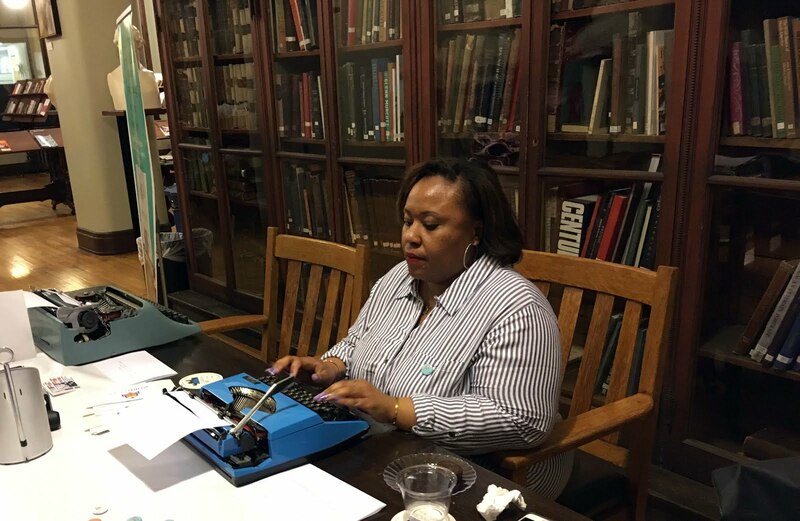 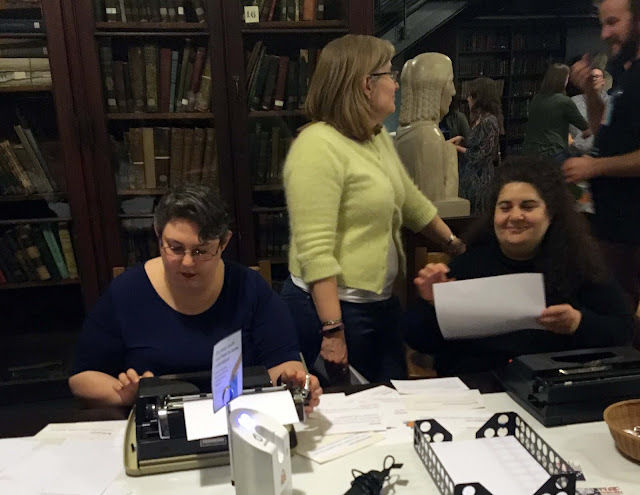 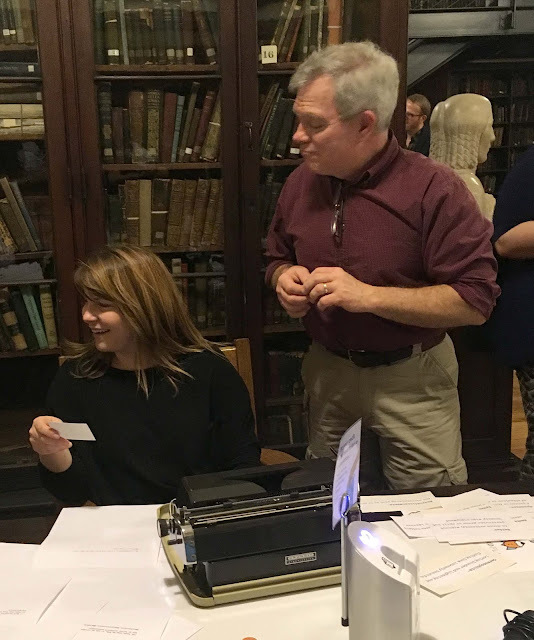 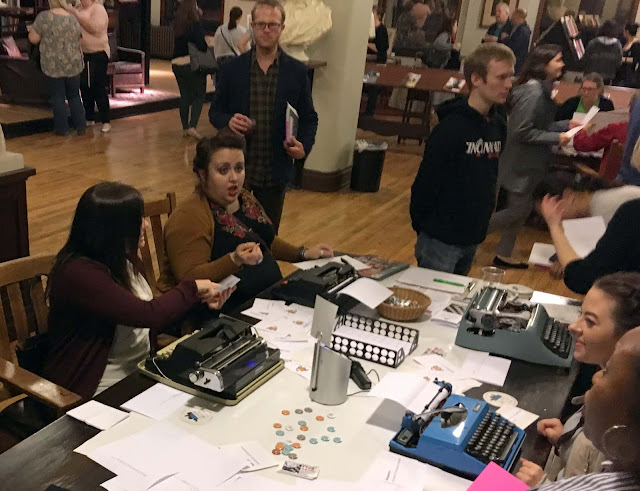 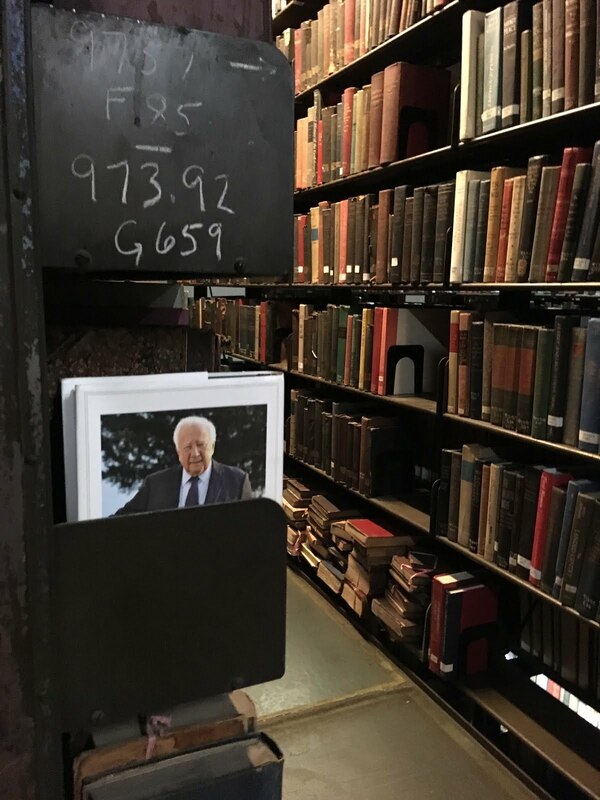 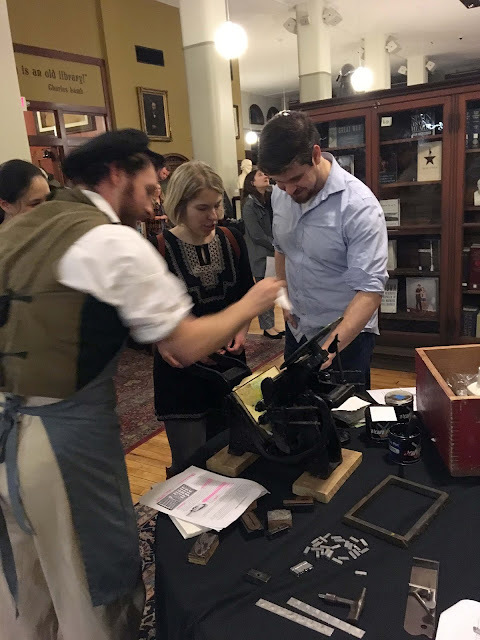 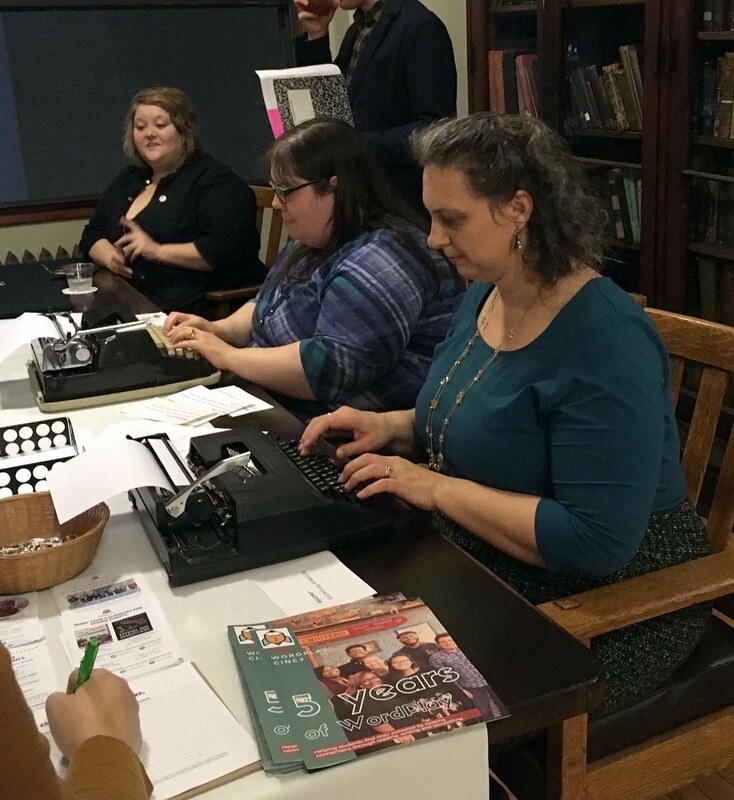 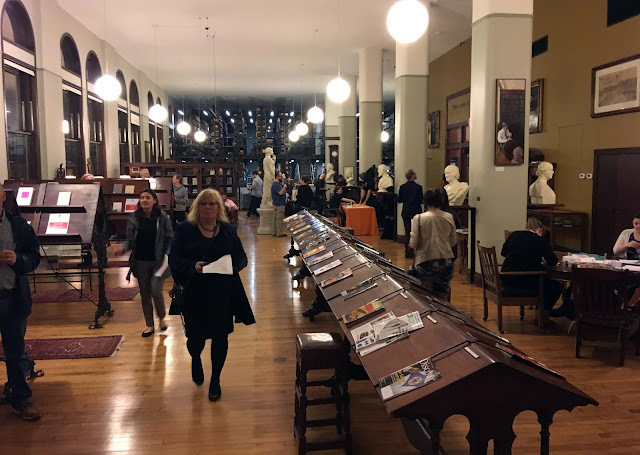 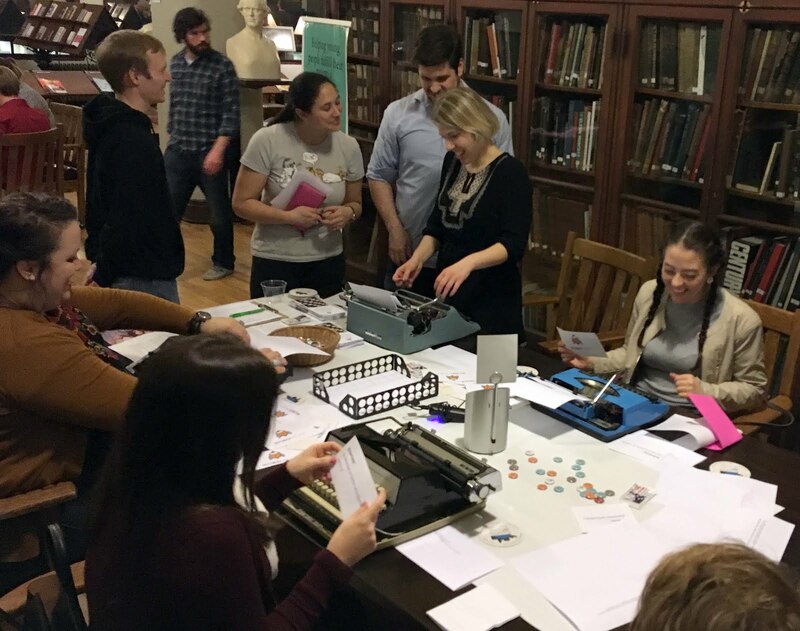 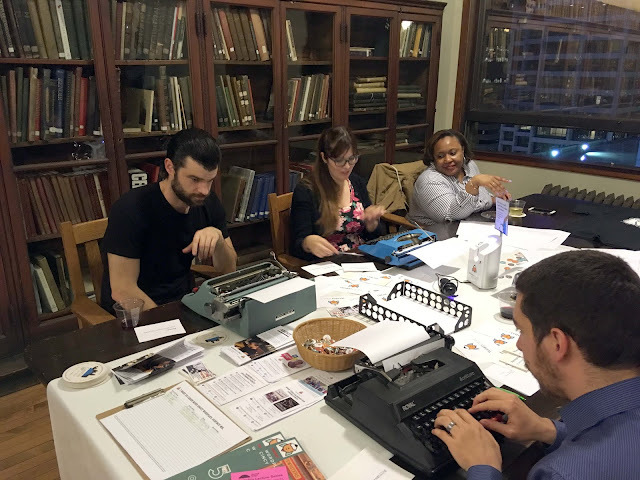 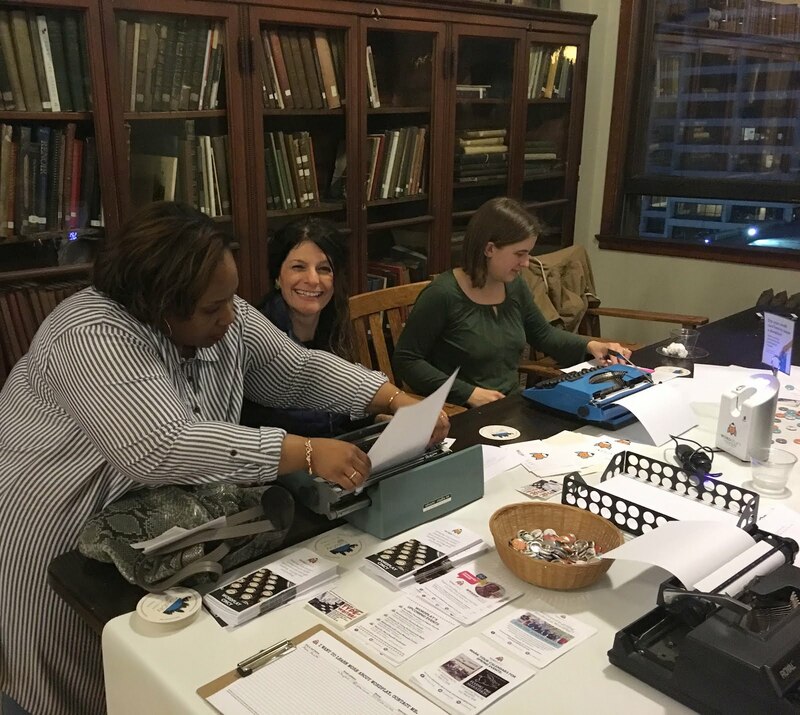 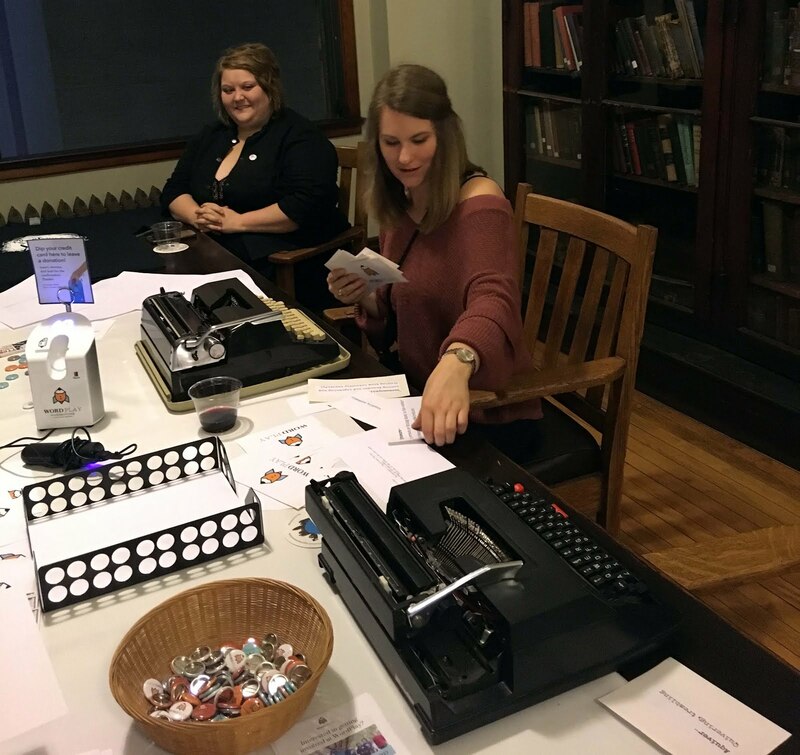 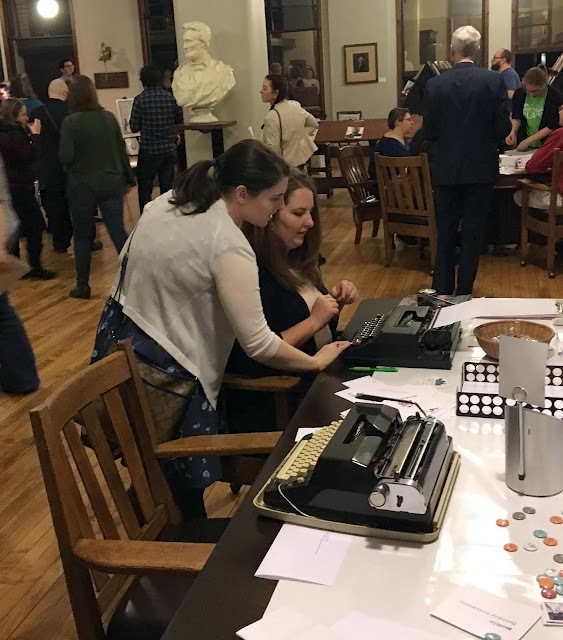 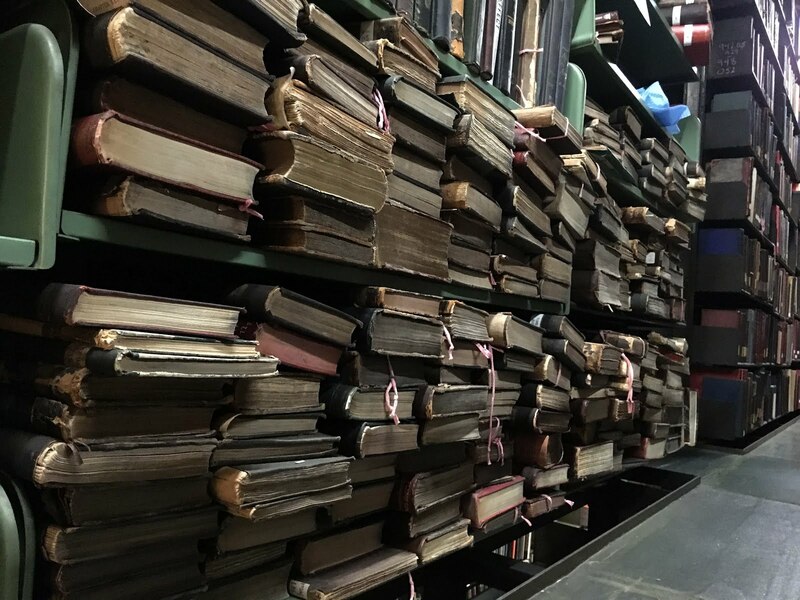 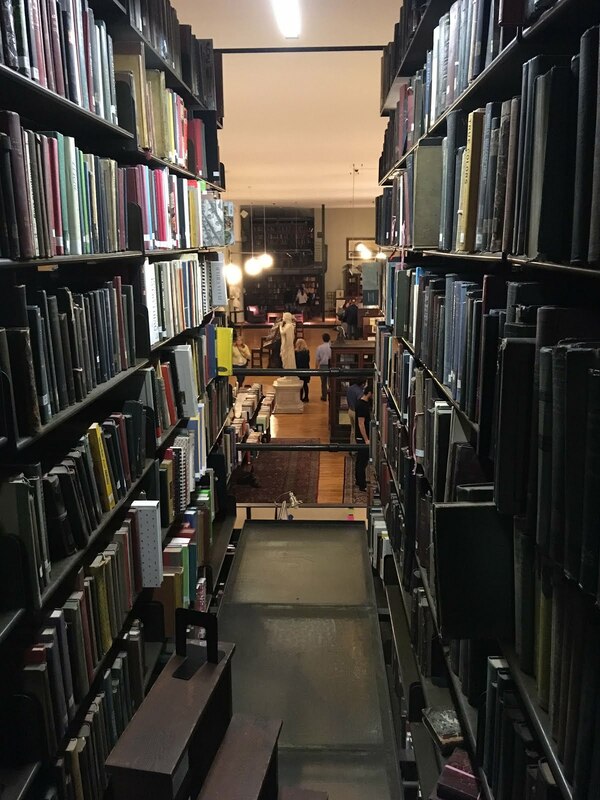 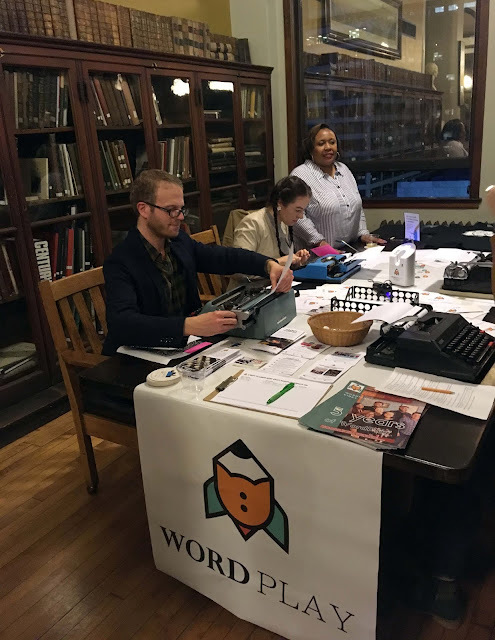 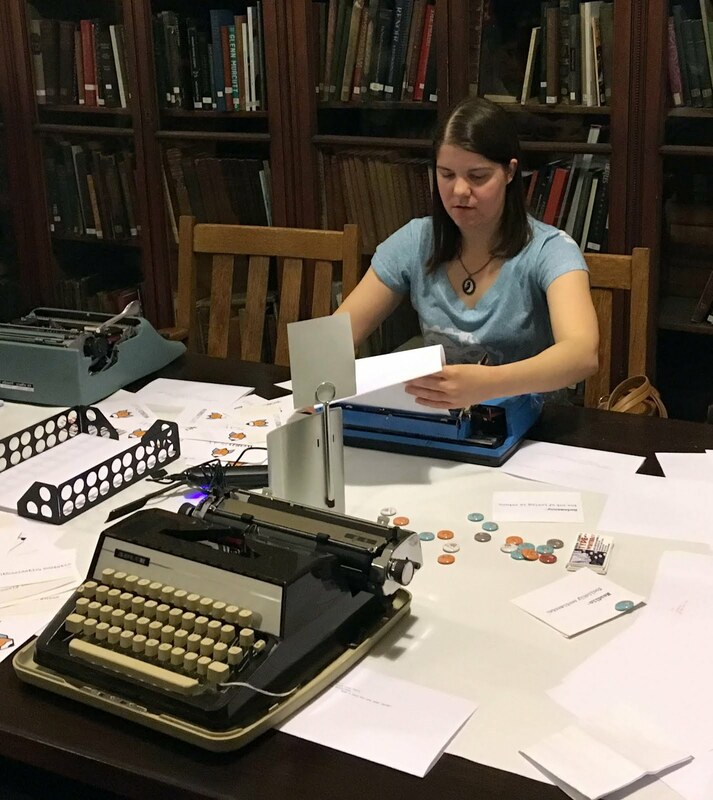 Last night, Cincinnati's beautiful Mercantile Library opened its doors to curious, fun-loving, and book-loving people who were invited to explore the stacks and participate in literary activities. 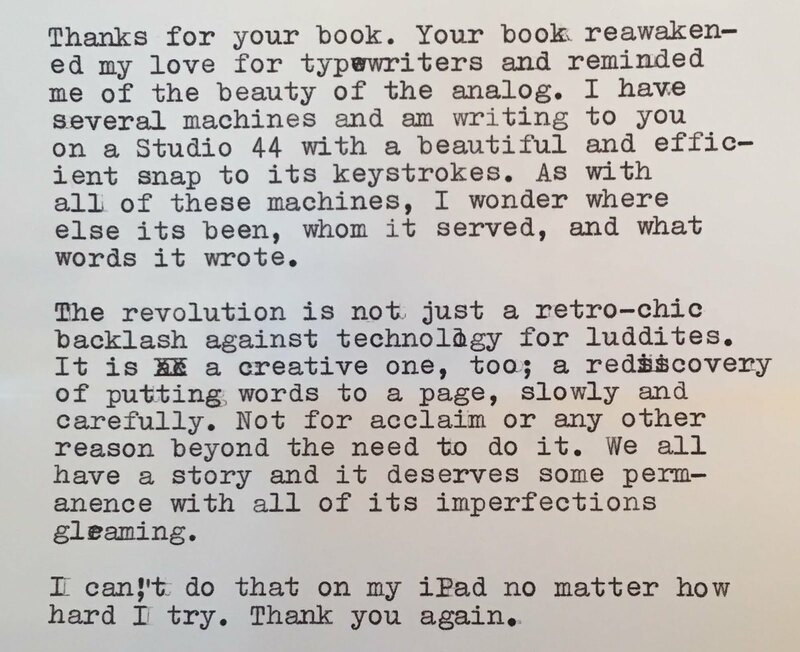 There's our typewriter-loving friend David McCullough. 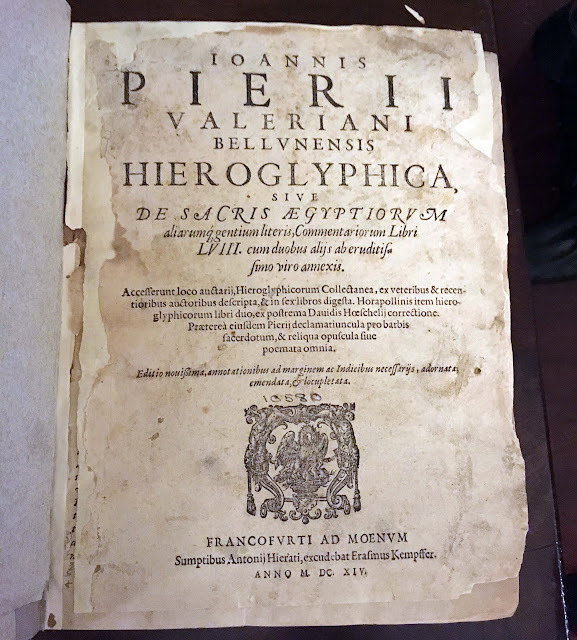 This 1614 book on Egypt is the oldest in the library's collection. 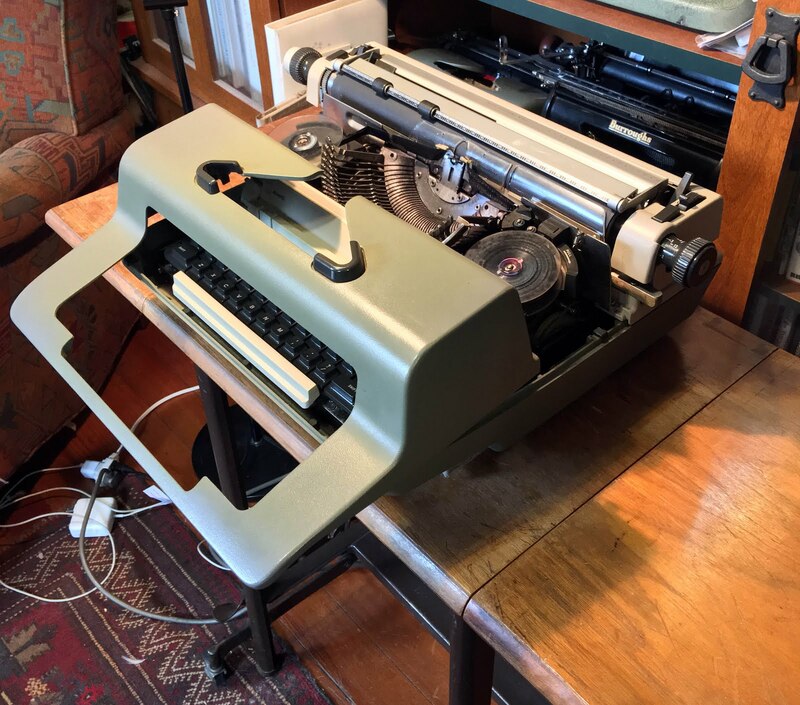 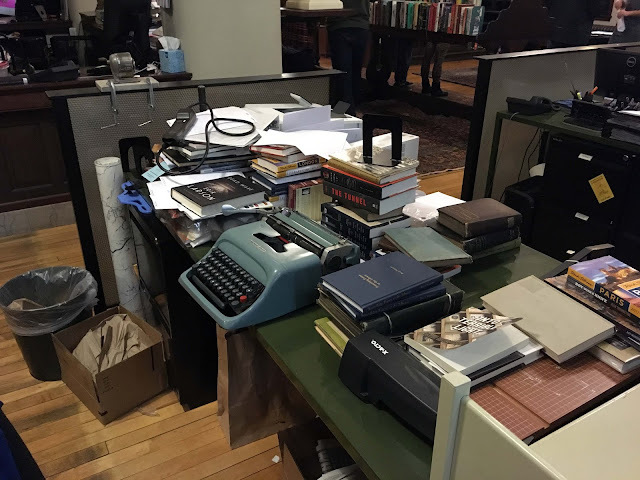 Librarian Cedric Rose happily uses an Olivetti Studio 44 at his desk. 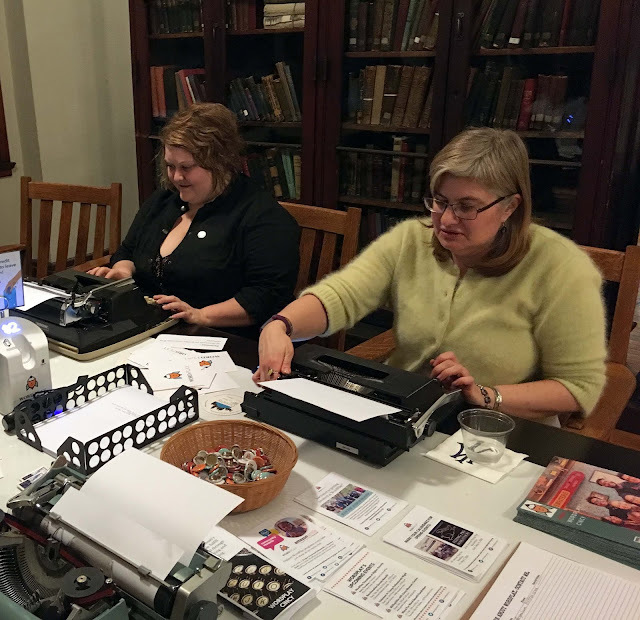 ... but the challenge was fun! 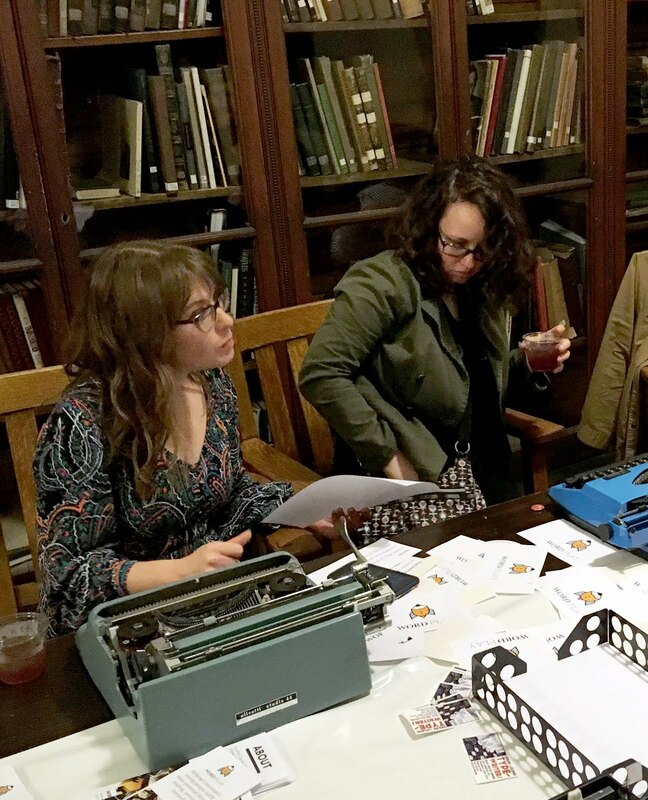 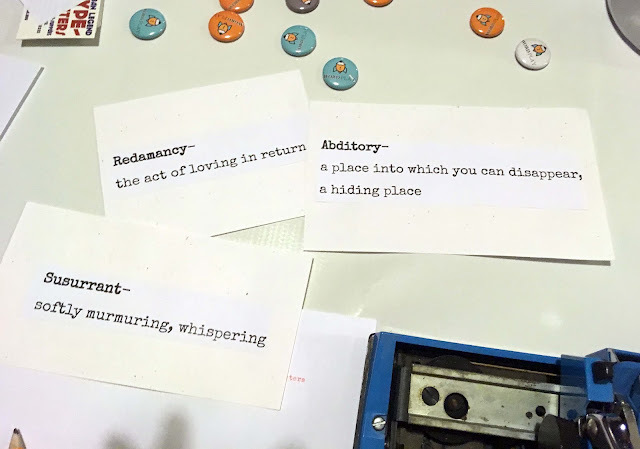 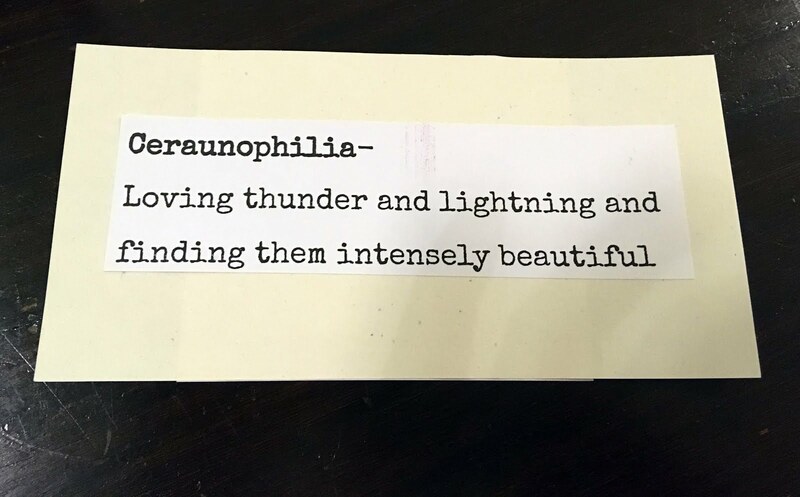 Try typewritten twitterature at your next party!